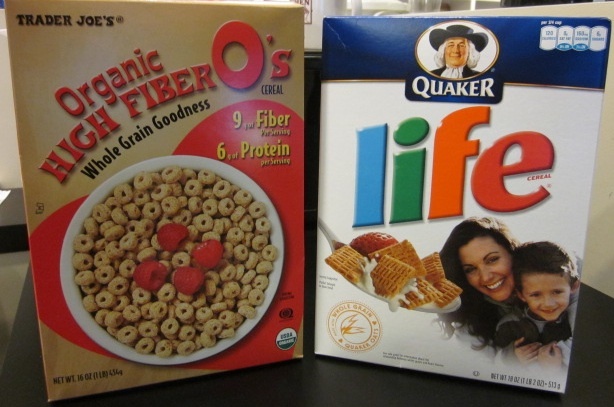 From when I was a youngster until I was well into my forties, I loved Life cereal. It was the right balance of sweet and bland – just like my winning personality (on a good day). Then, three years ago this month The Big Negative happened. My employer, Get Rich Never, slashed my wages by 20%. That pay cut, which spreads wider every year like the proliferation of middle age flab, was a wake-up call to me to eat healthier. Ever since my salary entered freefall I do my best to steer clear of processed food and that includes my beloved Life cereal. Life contains two yellow food dyes # 5 and #6 and the additive, BHT — butylated hydroxytoluene. Wow, talk about an appetite suppressant! I make a conscious effort to only eat cereals that are organic and produced without preservatives. Twigs, Flakes, Clusters and (they forgot to mention) No Flavor! I had reasoned that eating better is one way to avoid having to see a doctor. Ironically, eight months into the horror of The Big Negative when I had assumed the diet of a self-denying ascetic that whips herself raw with a cat-o’-nine-tails and then cannonballs into an acid bath, I was diagnosed with such debilitating gastrointestinal disease, an illness I initially confused with tree pollen and grass allergies, it’s remarkable that I’m still alive. Through medication I was able to quit taking in 2010, and a diet that has now removed almost every food with a hint of flavor from my menu, I have fully regained my health. I’ll drink to that — even though I’ve been advised not to (as if that will ever happen). Following my recent vacation where I allowed myself many lethal indulgences including bacon, brandy-filled chocolate, and a bottomless pit of fat and carbs, I returned home with such a prominent abdominal bulge I suspected that I was either transforming into a kangaroo or had swallowed my young. In my case, that would be Thurber, the family dog, since my niece, Sweet Pea, is my height. "Look at me ignore you." Me: To hell with the horrors of food dyes and BHT! I’m destined to croak of something! I’ll return to eating organic fortified mulch and wood shavings the rest of the year! With a bounce in my step and a satisfied smile on my face that brings to mind the aftermath of carnal pleasure with a rare breed of romantic partner, a special someone not blind, brain damaged and added bonus, willing, I avidly anticipated the next morning’s breakfast when I would dive my spoon deeply into a heaping pile of Life. I did just that and chowed down that bowl of sweet and bland fake colored oat squares with gusto. An hour later, I was in the bathroom suffering what can best be described as a near-death experience that continued off and on throughout the entirety of the day. I concluded that this might have been a side effect in a body that was a born-again BHT and food dye virgin. Although I had some trepidation eating another bowl of Life the next day, I seem to have reestablished a rapport with toxic food chemicals, but once I polish off this box of Life, I’m going to resume my daily morning duet with Trader Joe’s Organic High Fiber O’s. 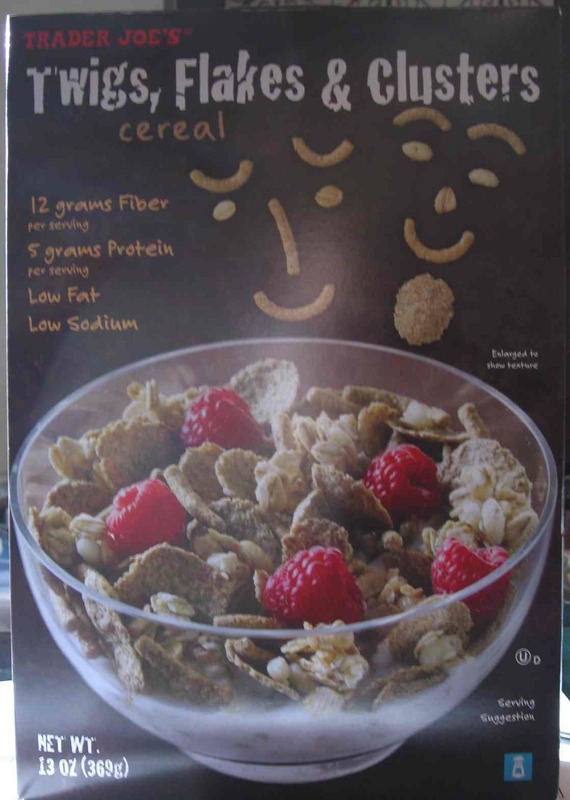 That cereal tastes much more like tree bark, but I doubt that it will expedite my visit to the crematorium. 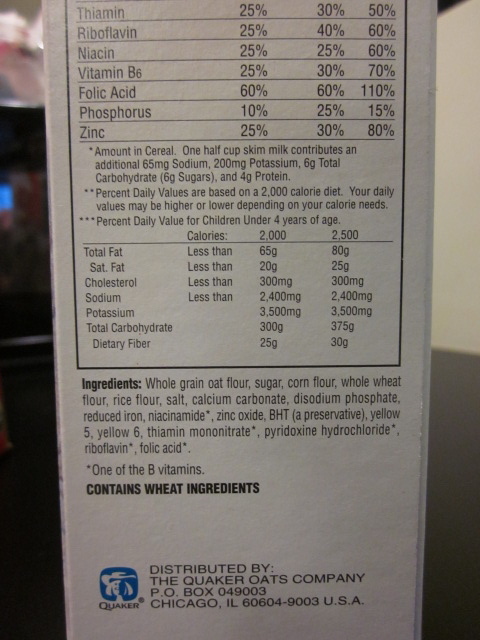 This entry was posted in Humor and tagged bht, breakfast, life cereal, organic, preservative, toxic. Bookmark the permalink. OW! I long for – almost every day – I long for a giant bowl of Cocoa Puffs. And someday, I’ll too throw caution to the winds and indulge! You are brave, dear girl. I got rid of the last of my cereals a month ago. They’re the candy of breakfast foods. Wait, no, that’s bacon. Twigs flakes and clusters?! There’s no way that’s real…why would someone call food twigs?? Did you photoshop that? Nope. That’s a real cereal. Available at Trader Joe’s. It tastes as dull as it looks. I bet you still eat that crap, Max! Since you have the intestinal fortitude of a mountain goat, I also bet you never experience any ill side effects! I’m actually a huge fan of something even worse–the Pop Tart, especially strawberry with no icing. Soooooo good. Sorry to hear Life brought on the “near death” experience–but that’s just too good a gastro-intestinal irony to pass up. Right? The Pop Tart was a big disappointment to me. There was too much tart, but not enough pop. Maybe I was spoiled by my grandmother’s baking for she always had a heavy hand with fillings. I loved that! God I could eat a box of cereal in a day, no problem at all. So awful. I can’t keep them in my house. Now I’m back in the Apple, so fun times are over. Boo hoo. Hey, thanks for visiting Lame Adventureland, Tracy! Please give Joe and Cheryl my best. I had one of my best laughs ever in Florida at a tile trade show with him. It involved a pressed tree branch pattern tile as my boss negotiated a miniature version for display. Joe and I exchanged eye contact and all I said was something like, “Stonehenge” and “Spinal Tap” and we were both convulsing. With the little dancers….one of my favorite movie moments! Peter Immordino, my former, was Joe’s roommate at Alfred University- Peter was a founding partner at McIntyre Tile back in 1972-1995- he is now at Sonoma Tilemakers in Windsor, CA. Those crazy Ceramic Engineers! http://www.winetimewithtr.com – you are inspirational!!! I’ve been called many things in my life, but “inspirational” is truly a first. Now I know what it must feel like to be Reverend Billy Graham. Funny you would mention Reverend Billy…my Grandma Betty was a proselytizer on his campaigns back in the day…. Lean heavily left on politics? No- spreading the word of Jesus in his huge conventions and on TV…. “his” being Billy Graham’s- not Jesus’s…. So much clarifying. Wasn’t the original topic breakfast cereal? 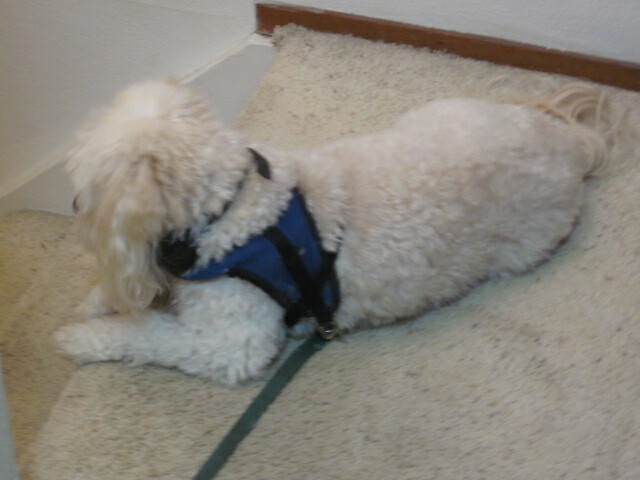 I can sympathize with you about your intestinal difficulties, although I’m not personally afflicted. My daughter has a wheat intolerance and can’t eat anything with even the slightest bit of flour without having stomach pains. My husband can’t eat any animal fat. It’s like having Jack Sprat and his wife in our family. You’re married to Jack Sprat — I love it! With my father having a serious heart condition, my brother suffering mental impairment forever worrying about the sodium content in everything (if you get the short straw and meet Axel, never mention fresh carrots around him!) and my own list that’s more like a scroll covering all of my Do Not Eat foods coupled with debilitating lactose intolerance, my sister has no choice but to start planning our compromise solution Christmas dinner in mid-fall just to see where everyone is at food quirk-wise.